Archaeologists are studying the significance of caves and remnants of bones unearthed recently in Amman during construction work, government officials said on Monday. The archaeological finds were discovered last week during the construction of a building near the Sports City Circle behind Al Arab Al Yawm newspaper, Department of Antiquities (DoA) acting Director Fares Hmoud, said yesterday. 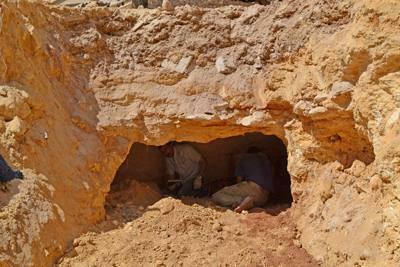 "The caves contained bones and pottery dating back to the Early Bronze Age," he told The Jordan Times. The caves indicate that the area is an extension of the Qatanah settlement, which dates back to the Early Bronze Age, and used to be surrounded by fertile agricultural lands, Hmoud said. The area around Safeway supermarket in Shmeisani and the Sports City Circle constituted the Qatanah settlement, according to the DoA. "Remains of the settlement existed until the early 20th century but were removed after development of the area started," he added. Tombs during the Bronze Age were characterised by small, vertical entrances that led into a chamber carved in limestone, where the bodies were buried along with grave gifts, including pottery. "The department has carried out initial rescue excavations, scientifically documented the site and then covered it again to preserve it," Hmoud noted. He underscored that the DoA teams will study the site and the artefacts to determine their significance, noting that the DoA will appropriate the site if studies reveal its archaeological importance. The Bronze Age is a period characterised by the use of copper and its alloy bronze as the chief hard materials in the manufacture of some implements and weapons. Chronologically, it stands between the Stone Age and Iron Age, according to web sources.